Home - Elizabeth Yarnell, naturopathic doctor specializing in food sensitivities (MRT, CLT), health, diet and nutrition speaker. Whether you suffer from occasional or chronic gastro-intestinal issues, are battling auto-immune symptoms, or simply want to learn more natural and effective approaches to reclaiming your health, I’ve got information you can use to improve how you feel just by changing what you are eating. New, state-of-the-art blood testing for sneaky food and chemical sensitivities. Customized anti-inflammatory diets for adults or children. Personalized healthy recipes and insider tips. Alternative remedies offered from an experienced, board-certified Naturopathic doctor (ND). Information to a healthier you is a click away. MEETING PLANNERS: Employee wellness affects the bottom line! Check out my inspiring and motivating keynotes and breakout sessions on the debilitating effects of hidden inflammation and how to feel better naturally. More than 60,000 copies sold! Are you too busy to eat right? Do you want to eat healthier meals more regularly? Trying to feed your kids healthy foods and keep them away from junk? Home cooks adore my patented infusion cooking method because it makes cooking dinner so easy! 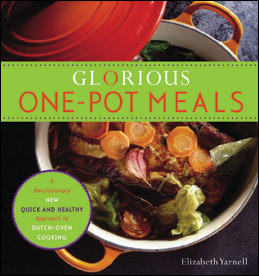 Learn more about how Glorious One-Pot Meals can change your life in the kitchen.